Non-trivial applications will need to pass some context to the completion handler, such as a this pointer. 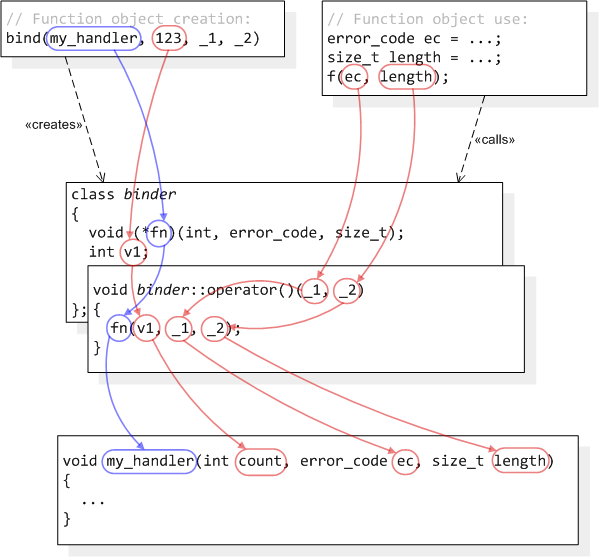 One way to do this is to use a function object adapter like boost::bind, std::tr1::bind or (as of C++0x) std::bind. Unfortunately, for many C++ programmers, bind represents a little bit of magic. This is not helped by the impenetrable compiler errors that confront you when you use it incorrectly. And, in my experience, the underlying concept (where some function arguments are bound up-front, while others are delayed until the point of call) can present quite a steep learning curve. 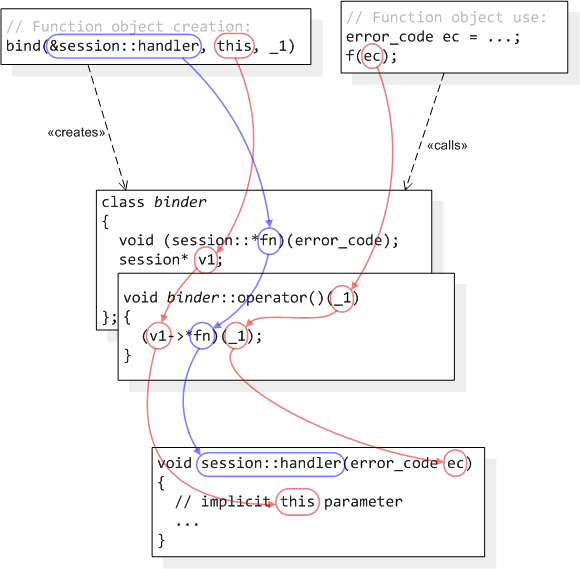 I have put together some diagrams to help explain how bind works. For clarity, I have taken a few liberties with C++ syntax (e.g. 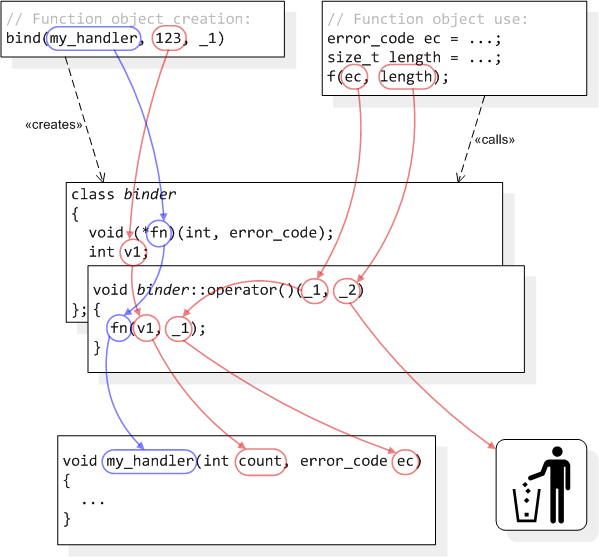 omitting the parameter types on the function call operator) and (over-)simplified bind's implementation. Finally, the examples are limited to those likely to be useful with Asio. Comments and suggestions welcome. A picture is worth a thousand words. Well done. Thank you! The high volume of posts last few weeks have been great, much appreciated and keep'em coming! 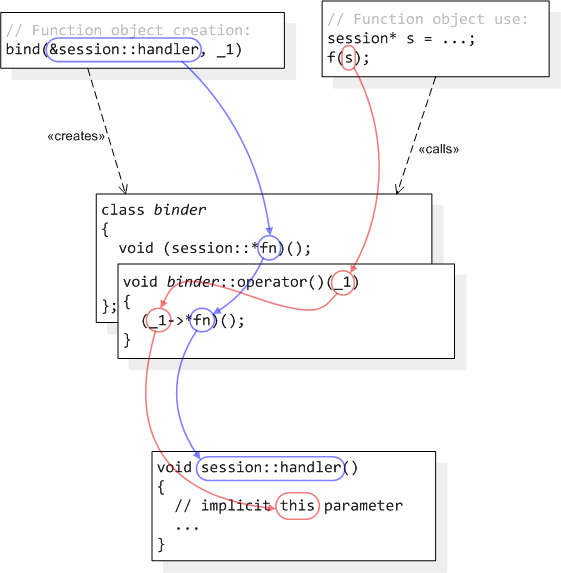 Please, add some words about yours box() function (with diagrams for the nested binds). Thanks for the pictures, that's what I was looking for as the bind documentation is somewhat unclear. 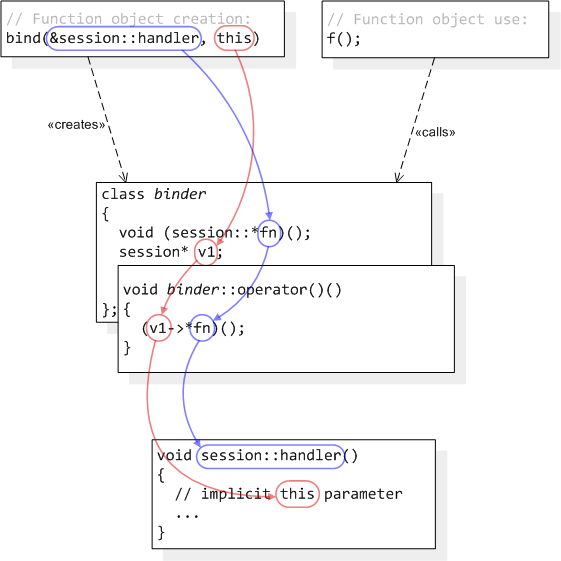 may i ask what software did you use to create the diagrams? Thanks for the summary. 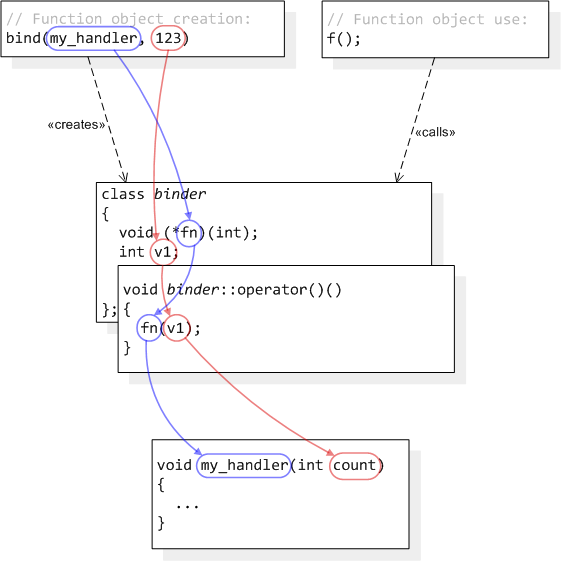 It'd be interesting to see how C++11 lambdas compare to bind. In particular, in what situations is bind preferred, and why? when we bind some member fn pointer to this pointer . doesn't bind has to figure out the first parameter arg is normal function pointer or member fn pointer so that it binds member fn pointer to this pointer correctly? can you also explain how does correct interpretation takes place? Sometimes three year old posts are really helpful! Thanks for being one of those who care for people and mankind. I'd like to be one of you. Thank you so much! Excellent article! Very nicely explained thank you !!! The best argument against democracy is a five-minute conversation with the average voter. See the link below for more info. Best explanation making it so easy to understand. I invested many hours (without getting any idea) on other links and 3 minutes on your link, must say those 3 minutes did magic. Each picture is worth thousand (or more) words. Author of the Boost.Asio library for networking in C++.